Nov. 17 is considered to be the beginning of our velvet revolution, but this day was not a bolt out of a clear sky, though it may have seemed like it. Throughout the whole of the ’70s and ’80s, foreign journalists visited me, and periodically told me that [dissident human rights movement] Charter 77 was an isolated grouplet of quixotic intellectuals, but that Czechoslovak society was apathetic, the regime conservative, and that nothing could change without factory workers rising en masse against the regime. I kept telling them: be careful, it’s not so simple. Reality under a totalitarian regime is not always readily intelligible when viewed from a distance. In the absence of freedom of expression, very few have insight into the lower  I would say, subconscious  levels of social life and shifts that occur. No one knows exactly which occurrences will prove to be significant, how they mature, and what they turn into. No one knows which inconspicuous snowball has the capacity to set off an avalanche, which, to the surprise of all observers, will radically change the political situation. Nov. 17 confirmed my assessment of the situation. The disgust with our conservative communist regime and the desire for change reached such a level that one event was enough to become a snowball that brought down an avalanche with it. I cannot overstate the importance of the atmosphere of general understanding, tolerance and self-sacrifice that accompanied those days. To a large degree the atmosphere also reflected the idea of peaceful resistance as embodied by Charter 77. We have been building upon these foundations ever since. 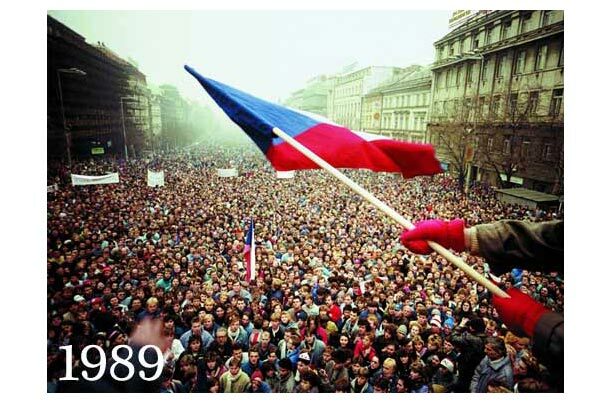 They cemented in the foundation of our new democracy  then Czechoslovak, today Czech  certain values, certain ideals that continue to exert their influence. The first Czechoslovak President, Tomás Garrigue Masaryk, once wrote that states are sustained by those ideals by which they were established. And it may be true in this circumstance as well.